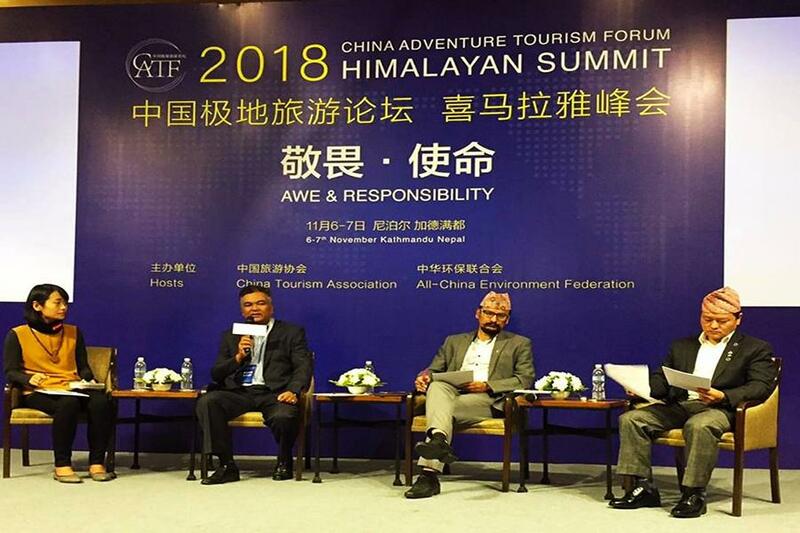 KATHMANDU, Nov 06: The China Adventure Tourism Forum-Himalayan Summit 2018 kicked off in Nepal's capital Kathmandu on Tuesday under the theme "Awe and Responsibility". Nearly 100 people including tourism entrepreneurs and experts from China and Nepal participated at the summit hosted by the China Tourism Association and the All China Environment Federation. The two-day summit dwells on the various aspects of tourism, particularly about prospects of adventure tourism along with importance of environment protection and Nepal-China relations. Addressing the inaugural ceremony, Duan Qiang, president of China Tourism Association said that adventure tourism holds a wide scope covering polar regions to ocean, desert to mountains. "Adventure can be merged with various tourism components like culture, sports, geography and business. Though it is in initial stage, it has a wide scope," Duan said. He further said that Nepal is becoming a popular destination for adventure enthusiasts from China for hiking, trekking, mountaineering or canyoning. On the occasion, an official from the Nepal Tourism Board (NTB), the major tourism promotion body of the country, said that the summit will pave the way for better tourism standards for sustainable and ecological tourism practices. "Nepal has focused on improving infrastructure, air and land accessibility, new tourism products, attractions, amenities and naturally targeted promotional campaigns for China and other emerging markets," Nandini Lahe Thapa, officiating CEO of NTB, said. She also took the occasion to mention that the Nepal government has announced the year 2020 as Visit Nepal Year with a target of welcoming 2 million tourists to Nepal, while Nepal is preparing itself to receive more Chinese tourists.